t’s the Holiday Season. If that’s news to you, then your cave needs more windows. The Holidays bring with them a lot of stress and some truly odd behavior. Today’s topic is Holiday Syndrome. First, I’m not going to ask what your chosen holiday might be. Nor am I going to succumb to the War and call everything Christmas just to be on the safe side. 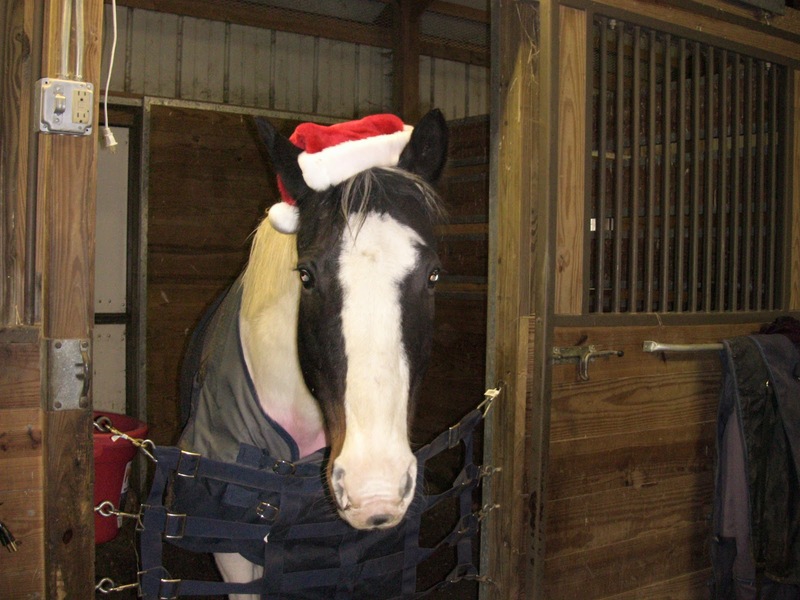 I know for a fact that my readers are an eclectic bunch, as are their horses and their ideas of holiday celebration. All of the holiday season engages us in an inordinate amount of stress and anxiety, not just because we can’t settle on a name for it all, but because we focus our entire sense of humanity and charity on a short period in the winter without any thought about why we’re so damned stingy the rest of the time. We need to do better than that, but that's a different post. The Big Conversation, the raging argument over what to call this time period, truly does a disservice to the real problem at hand, to wit: What shall I buy my horse/dog/cat/gerbil so he won’t feel left out? First, I’m pretty sure that your animal partners have no clue there’s anything unusual afoot until the moment the animated deer or inflatable elf suddenly lights up the yard and scares the bejeezus out of them. For most animals, the winter holiday season is a time of freakiness, highlighted by musical lighting arrangements and owners wearing a lot of the only color most horses really recognize: Red. Most likely, if you asked your horse what he wants for the holiday, he’d answer that he’d like his owner’s mind back. So the concern about what sort of gift to buy him is something probably best put on a back burner while you sort out all the strange human relatives first. In order to make your holidays simpler, here are a few reminders and suggestions to help you and your chosen animal buddies through the crazy season. 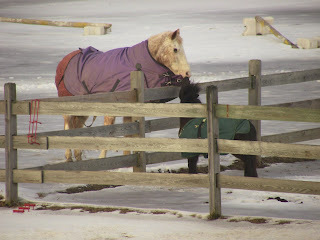 · Animals are not all fond of wearing clothing at any time of year, not just at the winter holidays. If they are willing to let you put a red hat or antlers on their heads or dress them as elves or snowmen or whatever floats your holiday boat, and if they do that without biting you or each other, consider that their gift to you. No need to get more touchy-feely than that. Taking off the hat/horns/whatever can be your gift to them. A cookie would also be nice. · Your house pet might feel a little left out when the family is gathered ripping into packages and they have nothing to tear. He’s probably happy to tear up something you’ve already opened, so just give the cat the box or the dog the paper and let them have at it. Then give them a cookie. 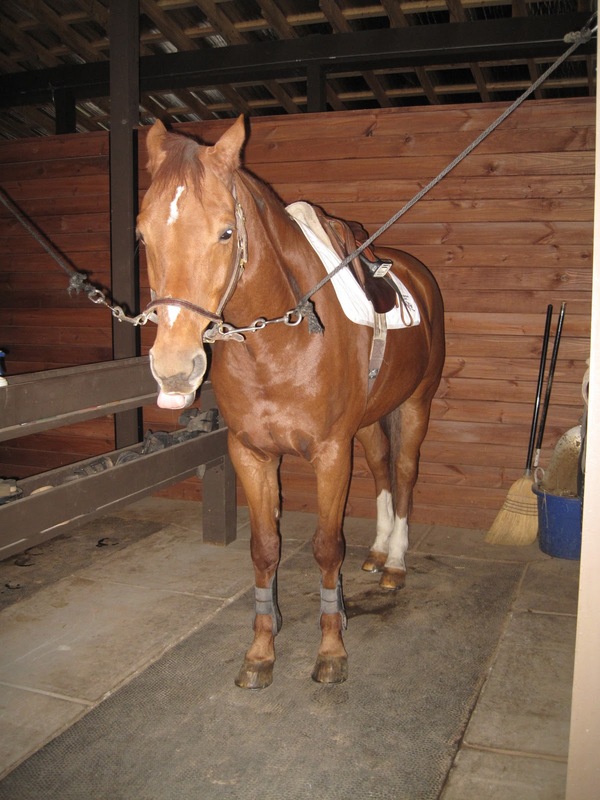 · Some horse owners get all fuzzy and decide a “nice hot bran mash” is just the ticket for holiday breakfast for their favorite equine buddy. He may like it. Just remember as you shove the kids out of the house to clear the kitchen for your mash-making episode that you’re the one who’s benefiting most from the effort, not the horse. Give him a cookie, and he’ll be Just as happy. teaming up with Duke to get the thing off him. · When you’re already financially stressed and you’re counting pennies to pay off the lay-away at Wal Mart for your kids’ winter clothes is not the time to be fussing over the perfect winter blanket for Fluffernutter. If he needs one, he probably needed it before this when it was on off-season sale. And “I’ll buy the most expensive one” because it’s a holiday gift is bizarre thinking. Get him whatever is on sale that will work, and invest the extra in a really special cookie. The yummy, soft cookies I bought this year were so special I couldn’t get the horses to leave the barn after they had their allotted one cookie each. That kind of gratitude and excitement never followed the presentation of a bright purple, high-necked, gusseted blanket with a lifetime tear-resistant guarantee. · Finally, probably the best thing you can do for your horses is to keep them in mind and heart and not disrupt their world any more than necessary. Just because it’s a holiday for you doesn’t mean they’re going to set aside their herd hierarchy issues and deal with sharing a paddock because it looks so festive or forgive you for the frozen water buckets because you're so obviously distracted. They’re not suddenly going to be broke to pull a sleigh or enjoy giving rides to your kids, grandkids, neighbor’s grandkids, or paunchy Uncle Walt. Believe in miracles if you wish, but remember that the horses are horses and believe mostly in the next meal and their sacrosanct spot in line at the water trough. Remember that if it's winter in your locale, you need to be sure every animal in your house and barn has what they need to survive. If you buy silly gifts, make sure they're safe for the animals. And if you can spare more than a minute or two, a scratch behind the ear, a pat on the head, or a thorough grooming will be much appreciated. Happy Holidays! May the New Year bring you and your non-human family everything you desire and a small dose of sanity to top it off. "The economic invisibility of Nature...." That has a very sad and forbidding sound. Pavan Sukdev has it right. It's not just about the Amazonian rain forest and the ecosystem. It's about our own survival. and the coyote killing the groundhog. When you are worrying about making your next board payment, it's probably hard to see the value in what you're doing, but it's there. Your feeding that horse and keeping him healthy means that the vet and the barn owner also get to eat and pay their bills. No, I'm not being sarcastic...very much, anyway. I'm talking about the local ecosystem, the "benefits that flow from Nature to humanity for free", what your horse ownership does for you and for the system around you. You pay, and the people you pay get to pay other people. You buy tack, and somewhere a guy with a cow skin laid across his work bench gets to buy another roll of waxed thread and have a burger while he works. You buy a slinky, and the spangle industry feels a friendly bump. The land your horse is turning into a mud-wrestling pit as you read this is open space that is so very vital to the planet and the local ecology. Fields, trees, even the bits of undigested grain in his 50 pounds of daily manure requirement feed and house other animals. Do you ever think about the flies that buzz so happily around your manure pile? Yes, they're annoying, but without them there would be no maggots, and without maggots there would be some serious pile-ups of biological materials that they devote themselves to breaking down. Doesn't that suggest that you're doing a good thing? Something to be admired, even? It does, and it should. I know first hand how hard it is to explain this lifestyle to people not involved in any way with livestock. It's hard to explain to other livestock people why we keep animals that don't give milk, lay eggs, or put steak on the table. In my book, that gives us an extra gold star on our mental health reports. We do it just to do it. Sometimes we get so caught up in the economic minutiae of the world that we forget that all of that other stuff is mere human construct. Wall Street (occupied or otherwise), politics, religion....all of it is meaningless in the face of Nature. The planet simply is. We play on it as we choose. It's my belief that those of us who choose to husband it even a little should respect our roles and ourselves whether or not we feel the love from everyone around us. In this economy, it's hard to justify horse ownership, but we must justify it to ourselves. Certainly, human construct or not, we also need to be sane and make sure our responsibilities are covered before we stretch farther than we can reach. But with the holiday season nearly at an end, I think it would behoove us all to step back and simply appreciate who we are, what we're doing, and the land and the animals that allow us to do it. pretty much knew before I read this article that horses were not the item. There's nothing cheap about them, and only non-horse people consider them a luxury item. We horse folk know that they are a total necessity, right up there with food, water, TiVo, and Ariat breeches. So of course I had to try to guess what the "cheap luxury" in question might be. Boxed wine? Burgers not served through a window? Okay, how many of you horsey types guessed it would be manicures? I'm still laughing at the idea that my discretionary income might be targeted at some cute young technician who has my hand trapped under a lamp for an hour. I will confess to enjoying the occasional pedicure, but I do not have the patience for a manicure. Tried it. I was a dismal failure. You can't even turn Equus magazine pages with your hands under a dryer! And how long does a mani last in the barn? My do-it-yourself version is nearly impervious, mostly because I use clear nail polish that's a version of the laquer used to seal the outside of an airplane, because the first time you scritch that cute equine under the chin, the sandpaper that is his hair simply peels lesser polishes right off. All of this made me wonder about the internal dialogs we carry on. I won't go into the whole "bubble" thing again. You know your sphere of reality is yours alone, yada, yada, yada. To complicate things even more, each of us has a story that we tell ourselves that makes it possible for us to get through our day without killing ourselves or someone else. Have you ever thought about what story you've decided to own? I have. So today we're going to discuss "redirecting", which is a not-so-new concept in psychology related to "reframing" and closely allied with "denial" but more positive in effect. We're going to start the discussion with a book recommendation: Redirect: The Surprising New Science of Psychological Change, by psychologist Timothy D. Wilson. No, I'm not going to make you go order it and read it while I wait. I'll trust you to do that later as homework. And that right there is some prime redirecting. By telling you I trust you to do that, I call on the story that you've put in place that tells you who you are (an honorable, responsible, and intelligent human being) and how you respond to things around you (with perfect elan at all times). Cool? You betcha! obstacle, and that I'm okay with that." That's Psych 201, Advanced Service to the Ego. As applied to horse people, the issue becomes just how far will you go to explain away your inability to ride Turkey Trot today? Do you have a story that accounts for your absolute abject terror at the very idea of hopping aboard a snorting, wild-eyed maniac horse who has your demise in his sights, and do you really need anything more than "My children would miss me if I broke my body before I made dinner"? 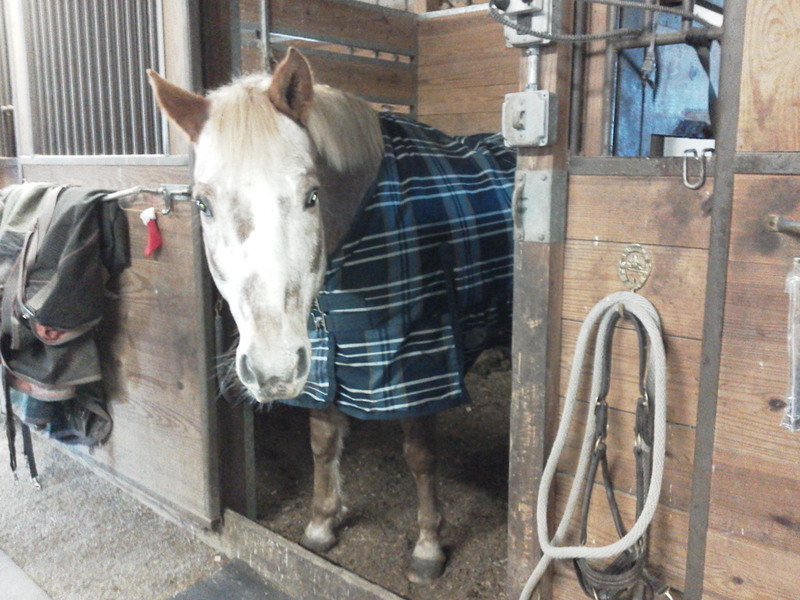 How about the one that gets you out of riding that 30-year-old former trail horse on a drizzly day? What's in your narrative to cover the 50 extra pounds you've put on that keep you from getting into your riding clothes? And is there something about your allergic reaction to the word "exercise"? For many people, the Will of a Deity is sufficient explanation and narrative to cover pretty much every eventuality. But you, my faithful and highly intelligent reader, are prepared to delve into your inner self. It may seem elementary, but the things we tell ourselves to help us survive life on this big blue ball affect us in ways that are often counter-intuitive. Some of the research revealed in Timothy Wilson's fascinating book indicates, for instance, that parenting is not nearly as intuitive as we thought, and that our narratives, adopted from various sources for various reasons, can make us fail dismally. Perhaps the most intriguing study cited involved post-trauma patients who were asked to either join a group counseling setting and discuss the trauma or go home and write about the incident in private. Conventional wisdom says that talking it out is the key to getting past the trauma. But...not so! Going home and quietly reframing and redirecting the story until it fits with your personal narrative turns out to be far more effective. The group didn't move forward. The private writers did. So when you're faced with one of those equestrian situations that threaten to destroy your confidence and shake your self-image, instead of calling all your horse buddies and whining and ranting and sharing Idiocies From My Past, try writing about it. Reframe the hell out of it until you can make sense of what happened, then go forth and try again. The cheap luxury you can't live without is insight into who you really are and why you do what you do. Only You Can Prevent Meltdown! Do Your Horses "Watch and Learn"? The Horse | Can Horses 'Watch and Learn'? I really thought this was a no-brainer. Goes to show how far "conventional wisdom" will take you in this horse life. I would have sworn--still do swear--that watching is how horses learn pretty much everything. Now along comes all this research stuff to prove me wrong. Huh. It's possible that horses don't learn everything by watching. I'm willing to grant that much. The focus of such studies tends to be on idiosyncracies like cribbing, weaving, or rooting for the Red Sox. I'm guessing the box-opening in this study might just not appeal to some horses. I'm also guessing (from my vast experience) that some horses just don't care to learn anything that isn't within certain limits of their intellects or their natural tendencies. Take the following examples under consideration. Zip (yeah, it always starts with Zip, doesn't it) taught himself to sweep the mat in front of his stall with a broom. My lovely barn slave, Breanna, discovered this talent, and it has become his signature move. He enjoys it so much (and gets rewarded so profusely) that I had to buy him his own whisk broom to keep him from destroying my personal favorite floor broom. He's been doing this for several years at every opportunity. Enter the new horses. Six or so years ago, I brought home the Appy, Dakota, and the mini, Duke. Neither of them knew any tricks on arrival. Duke, like any good dog, is a very quick study and took to clicker training as if he'd been born to it. Dakota just doesn't seem to see the point of doing anything...ever...for any reason. Totally opposite personalities. An extremely good boy. Note the open stall door. while I was in the house eating breakfast and doing chores! Time passed, and one boring winter day when the horses had been stalled longer than their usual two hours, I let Zip do his sweeping trick and treated him. Behind me, I heard an odd sound and turning to check the source (hoping it wasn't rodent-generated) I saw that Dakota had found a small branch in his hay corner and was sweeping the mat in front of his stall with it! Talk about a shocker. Many cookies ensued, and he did make one more move toward picking up the branch before he called it quits and moseyed out for the day. I was gleeful, thinking maybe I had proof that horses really do imitate each other with purpose and forethought, but what came next really floored me. I was busily with the post-mucking aisle sweeping, all the horses but Duke out in their respective turnouts (Duke likes to help in the morning...mostly himself to any fallen grain in the big horses' stalls) when I heard another sound and turned around to find that Duke had retrieved Zip's dropped broom and was sweeping behind me as I moved down the aisle! I applauded, shrieked, cookied, ans apparently scared the sweep right out of him as he never did it again. In fact, no cajoling on my part ever got him to even take the broom in his mouth again. But I know what I saw. I also know I saw Zip watch me fasten the gate then immediately unfasten it with his lips. He may not ever imitate Dakota's weird habit of lipping his bucked after each mouthful of grain, but he definitely mimicked me. If I put my head down, he puts his down. If I back up next to Duke, Duke backs up at the same pace. I didn't teach them these things purposely. I contend that they just watched and learned. The photo above is, I think, proof of something strange that I'm trying to classify. Dakota could have left at any point. Any of the other horses would have at least gone into the aisle and helped themselves to the hay stalls as Pokey did and Pinky did given the same opportunity. They're his barn mates, and he could have learned that from them. But unlike Pokey and Pinky, Dakota has Good Boy written all over his spirit. He only learns what he thinks is important, like how to stop at the gate and turn and block it (a Zip trick) hoping I'll ask him to do a trick for a cookie before pushing him out into the pasture. And like sweeping the floor...which he has never, never done again because...well, just because. So in the end, I think there's far more going on than just horses being capabable or incapabable of learning by example. It think there are parts of a horse that simply defy examination of any meaningful sort. I think they think. A lot. About things we haven't a clue about. And the surprises that come with that are more fun than a box of puppies. And I'm totally okay with that. 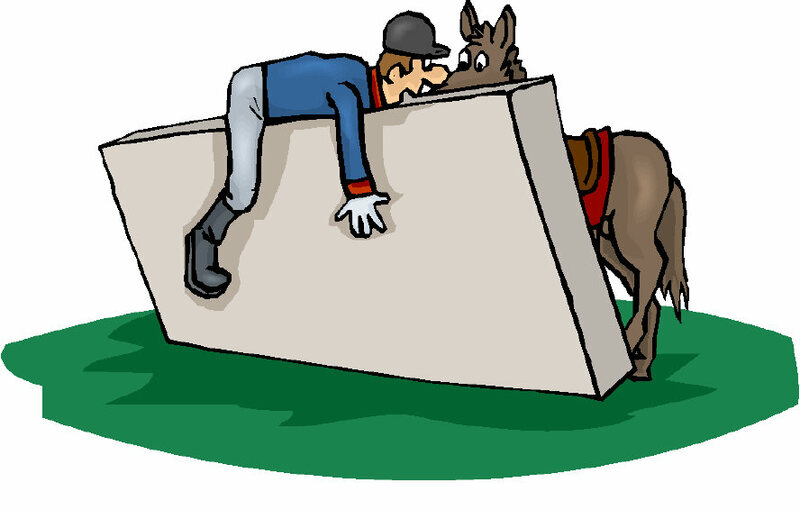 Are You Your Horse's Worst Enemy? pparently not, though you can’t prove that by me. This continuation of the series of articles in The Horse on recent behavioral research suggests that, while you certainly can ruin his otherwise excellent day and the mood that went with it, the amount of distress you accidentally cause your horse just by being you and doing what you do isn't nearly as bad as I, personally, imagined it to be. Whew! The article summarizes a study published in May in Physiology and Behavior (there's a link to the study's findings). The study checked heart rates on horses as they were lead, ridden, and otherwise handled, and (not surprisingly) found that most of us make our horses tense in the medium range of heart rate increases. Sometimes, watching Zip's eyes roll back in his head when I ask him to get off my foot or move a centimeter to the inside of the gate so I can close it (how do they do that thing where they know precisely where to stand to look like they're cooperating and still prevent gate closure? ), I would have expected his heart rate to be through the roof. I guess he fakes it well. Back to the study, again not surprising is the finding that horses being ridden by professionals are far less stressed than horses being ridden by, say, me. And leading is least stress-inducing of all. Judging from the video my daughter just sent me of the horse she's considering buying working on the longe during the pre-purchase exam, I'm going to have to say that longeing and leading are not at all in the same category. They didn't include round-penning in the study, but I would hazard a guess that it's among the more stressful activities since pressure and release of pressure is the name of that game and some of us should never be allowed in a round pen with a horse without adult supervision. new BFF, Jess to give him a stress-free life. Of course, we all know that we can be incredibly dumb when it comes to reading our horses' moods and body language. We can and do ruin perfectly good horses regularly, and they deserve better than many of us have to give. And we know that there are moments when the only thing standing between us and utter equestrian disaster is the unexpected kindness of the equine heart. We need to thank them for not killing us. Thank you, second-hand Billy Cook barrel saddle, for all the many, many years of safe and happy riding you have given this unrepentant English rider and multiple friends. Though your conchos have fallen of and you're looking a bit weary, you will always be my friend. Thank you, Irene and Breanna, my faithful barn hands, for letting me breathe easy when I'm not home to fuss over my equines myself. You're da bomb! Thanks, all you turkeys, pigs, geese, ducks, and tofurkeys who are about to give your last squawk (or in the case of tofurkeys, little squishy noises) for our dining pleasure. It's sad that you can't join us, but we'll certainly remember you fondly for the week after Thanksgiving. Special thanks goes out to whoever invented sweet potatoes with the little marshmallows on top. 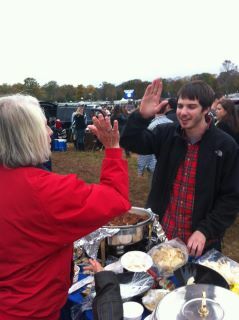 gratitude for cold chili. Thanks for not vomiting on me. Thanks, Jack, for bearing with me when I insisted on having you make a special pre-vacation trip to the farm to put Pokey's winter shoes on right after the only blizzard we've ever had in October even though you knew it was a dumb idea. As horseshoers go, you're the best. Thanks to all of the workers who will be manning the supermarkets tomorrow to help us forgetful idiots make our dinners complete. I hope you'll get to be with your families and friends for at least part of the day. Truly, we could live without that forgotten can of cranberry sauce if we really tried, and I'd be much happier if you were home watching the parade and the dog show and Uncle Bernie drooling on himself during his postprandial nappy time. Thank you, Zip, Leo, Dakota, Duke, Fancy, Pokey, Prince, Rat, Missy, Grady, and Dolly for your endless patience as I tried out random training methods and equipment on you year after year. I don't know why you put up with me. It sure can't be that scoop of grain and pile of hay and handful of cookies, right? It's got to be pure love....right? Indulge me here, please. And most of all, thank you, faithful readers, for actually spending your precious time reading my ramblings. I heart you all! This article is must reading. Yes, I said "must", which means I need to read it again. hat better time than the Holidays to put to rest those demons that whisper our faults in our ears until we are numb? In a much-needed act of kindness towards ourselves, it couldn't hurt to stop for a bit and wonder who in hell it was who made the rules that we are striving so hard to live by. Worse still, we strive to make other people live by the rules we've chosen as well. O, Joy! Like it's not hard enough to just get through the day with all of our aches and pains, idiosyncracies and dysfunctions, we also have to keep score for ourselves and stay on top of everyone around us. Is it any wonder that depression is a national affliction? Mike Robbins, motivational speaker and coach, pinpoints five problems and ideas for conquering them and making life a happier experience all around. For us horse people, every one of them pertains in spades. Who among us truly gives everyone (even that idiot down the road with the dog barking on the deck at all hours freaking out our spooky mount at the worst possible moment) the benefit of the doubt? I'm not sure I can find it in my heart to think rosy thoughts as I wrangle my hysterical horse out of earshot of the nasty mongrel, but I could probably manage a gratuitous "He probably chews the furniture if he's left alone in the house" in a less-resentful tone and without the "and it serves that idiot right" tag line. And at least it's five minutes when I'm not wondering if my weight is evenly split over my hip bones, if both heels are down appropriately, and if my back could be a bit rounder. Do I take things personally? Well, I can honestly say "not so much" to that one. That, however, is a sign of aging, not of kindness of spirit. I believe I read a research study once that indicated the age of 50 as a turning point for women. Pre-50 we're all about ourselves and our families and protecting the status quo. After 50, we become more other-directed. That's why most of the local charitable organizations and service groups are heavily populated by greying heads. It's hard to take things personally when the bigger picture suddenly becomes apparent like one of those 3-D "put your nose here and unfocus your eyes" things that goes from random colored flowers to a rocket headed for a far-off planet if you can just look at it long enough without getting a headache. The saying that is often attributed to Oprah, that we would stop worrying about what others think of us if we realized how seldom they do, holds true in pretty much every circumstance. If you've been reading this blog for a while, you may recall my lecture on spheres of reality and how each of us lives in our own and can't ever cross the bubble into someone else's. Remember that they're busy making it all about them, and you will automatically stop making it about you. Looking for the good is one of the easier assignments in this article. If you have horses (or any other animal...or small child...or man) living in your bubble, there always comes a moment when you have to justify to yourself that other being's presence and continued existence unmolested in your sphere. That's when you look at him or her (or Zip) and smile because as generally useless and majorly annoying as that being might be, there's just something there that makes it impossible for you to kill it or turn it loose to infest some other bubble. Just last weekend, the Dukester, my mini herd antagonist, had another emotional meltdown thanks to some neighborhood ne'er do well (yeah, the one with the dog) believing every holiday deserves to be celebrated by imported urban idiots shooting shotguns into my woods. As Duke was running laps at the end of the longe instead of doing his little perky Good-Boy thing and as the rest of the herd responded by losing their minds on the other side of the fence, the thought crossed my mind that Duke could go live somewhere else. It barely took form, however, before a dozen excuses for keeping him shot up to block it from my consciousness. Finding the good in anything can require some searching, but we generally manage. Seeking to understand before jumping to judgment is a toughie. I had a lot of experience with this as a special ed teacher. Since I wasn't allowed to beat or handcuff my students, trying to understand the why of their behavior was a must. I think that's harder to do when 1) there are fewer societal constraints than in the public school classroom, and 2) when it's a horse we're looking at. Alien brains are hard to fathom sometimes. I've often wondered why a particular horse chose a particular behavior that seemed so completely irrational and out-of-character. We try to understand, and sometimes we succeed. Mostly we succeed in projecting onto everyone and everything around us our personal view of the world. That's what makes this part of the assignment so difficult. Taking your "self" out of the equation is nearly as impossible as is seeing into someone else's personal bubble. So I suggest at this point we just reprise the first two suggestions--give them the benefit of the doubt and don't take whatever is happening personally--and hope for the best. Being gentle should be the basic human reaction to every situation, don't you think? How often is it? If the whip is the first line of defense when we're confused by our animal's behavior, then how likely is it that we'll be less defensive and controlling when it comes to ourselves and our fellow humans? There's something in society that rides the rail between being kind to ourselves and being self-indulgent. I know I can tell when I've crossed that line because it feels so damn good to be kind and I'm so guilt-ridden when I've indulged to the extent that I notice it. It's the one piece of chocolate (dark, for its anti-inflammatory properties of course) to celebrate a job well done as opposed to the new wardrobe to celebrate not killing one's spouse. We need to forgive ourselves and others for not meeting arbitrary standards. If we could master that, just think how far we could go toward a peaceful life. If we stop setting ourselves up as arbiters of what is right and good, we might discover that it really doesn't matter. Congress might even begin to function again! Wouldn't it be nice for just one day to be able to be completely at peace without the mega-job of controlling everything around us shadowing our every moment? Go forth and be less critical. It sure couldn't hurt.